(Leah Hogsten | The Salt Lake Tribune) Worshippers in the Greek Orthodox Church of Greater Salt Lake on Sunday endorsed talks with Salt Lake City-based Woodbury Corp. on a partnership to develop choice downtown properties around Holy Trinity Cathedral, at 279 South 300 West. Once at the heart of the city’s Greek Town, the parcels around the historic cathedral total about five acres of land, including several parking lots and the site of the distinct white La France Apartments, a set of about 60 aging row houses east of the church. (Leah Hogsten | The Salt Lake Tribune) Worshippers in the Greek Orthodox Church of Greater Salt Lake on Sunday endorsed talks with Salt Lake City-based Woodbury Corp. on a partnership to develop choice downtown properties around Holy Trinity Cathedral, at 279 South 300 West. Once at the heart of the city’s Greek Town, the parcels around the historic cathedral total about five acres of land, including several parking lots and the site of the distinct white La France Apartments, a set of about 60 aging row houses east of the church. (Leah Hogsten | The Salt Lake Tribune) Worshippers in the Greek Orthodox Church of Greater Salt Lake on Sunday endorsed talks with Salt Lake City-based Woodbury Corp. on a partnership to develop choice downtown properties around Holy Trinity Cathedral, at 279 South 300 West. Once at the heart of the city’s Greek Town, the parcels around the historic cathedral total about five acres of land, including several parking lots and the site of the distinct white La France Apartments, a set of about 60 aging row houses east of the church. (Leah Hogsten | The Salt Lake Tribune) Worshippers in the Greek Orthodox Church of Greater Salt Lake on Sunday endorsed talks with Salt Lake City-based Woodbury Corp. on a partnership to develop choice downtown properties around Holy Trinity Cathedral, at 279 South 300 West. Once at the heart of the city’s Greek Town, the parcels around the historic cathedral total about five acres of land, including several parking lots and the site of the distinct white La France Apartments, a set of about 60 aging row houses east of the church. (Leah Hogsten | The Salt Lake Tribune) Worshippers in the Greek Orthodox Church of Greater Salt Lake on Sunday endorsed talks with Salt Lake City-based Woodbury Corp. on a partnership to develop choice downtown properties around Holy Trinity Cathedral, at 279 South 300 West. Once at the heart of the city’s Greek Town, the parcels around the historic cathedral total about five acres of land, including several parking lots and the site of the distinct white La France Apartments, a set of about 60 aging row houses east of the church. (Leah Hogsten | The Salt Lake Tribune) Worshippers in the Greek Orthodox Church of Greater Salt Lake on Sunday endorsed talks with Salt Lake City-based Woodbury Corp. on a partnership to develop choice downtown properties around Holy Trinity Cathedral, at 279 South 300 West. Once at the heart of the city’s Greek Town, the parcels around the historic cathedral total about five acres of land, including several parking lots and the site of the distinct white La France Apartments, a set of about 60 aging row houses east of the church. (Leah Hogsten | The Salt Lake Tribune) Worshippers in the Greek Orthodox Church of Greater Salt Lake on Sunday endorsed talks with Salt Lake City-based Woodbury Corp. on a partnership to develop choice downtown properties around Holy Trinity Cathedral, at 279 South 300 West. Once at the heart of the city’s Greek Town, the parcels around the historic cathedral total about five acres of land, including several parking lots and the site of the distinct white La France Apartments, a set of about 60 aging row houses east of the church. (Leah Hogsten | The Salt Lake Tribune) Worshippers in the Greek Orthodox Church of Greater Salt Lake on Sunday endorsed talks with Salt Lake City-based Woodbury Corp. on a partnership to develop choice downtown properties around Holy Trinity Cathedral, at 279 South 300 West. Once at the heart of the city’s Greek Town, the parcels around the historic cathedral total about five acres of land, including several parking lots and the site of the distinct white La France Apartments, a set of about 60 aging row houses east of the church. (Leah Hogsten | The Salt Lake Tribune) Worshippers in the Greek Orthodox Church of Greater Salt Lake on Sunday endorsed talks with Salt Lake City-based Woodbury Corp. on a partnership to develop choice downtown properties around Holy Trinity Cathedral, at 279 South 300 West. Once at the heart of the city’s Greek Town, the parcels around the historic cathedral total about five acres of land, including several parking lots and the site of the distinct white La France Apartments, a set of about 60 aging row houses east of the church. (Leah Hogsten | The Salt Lake Tribune) Worshippers in the Greek Orthodox Church of Greater Salt Lake on Sunday endorsed talks with Salt Lake City-based Woodbury Corp. on a partnership to develop choice downtown properties around Holy Trinity Cathedral, at 279 South 300 West. Once at the heart of the city’s Greek Town, the parcels around the historic cathedral total about five acres of land, including several parking lots and the site of the distinct white La France Apartments, a set of about 60 aging row houses east of the church. (Leah Hogsten | The Salt Lake Tribune) Worshippers in the Greek Orthodox Church of Greater Salt Lake on Sunday endorsed talks with Salt Lake City-based Woodbury Corp. on a partnership to develop choice downtown properties around Holy Trinity Cathedral, at 279 South 300 West. Once at the heart of the city’s Greek Town, the parcels around the historic cathedral total about five acres of land, including several parking lots and the site of the distinct white La France Apartments, a set of about 60 aging row houses east of the church. (Leah Hogsten | The Salt Lake Tribune) Worshippers in the Greek Orthodox Church of Greater Salt Lake on Sunday endorsed talks with Salt Lake City-based Woodbury Corp. on a partnership to develop choice downtown properties around Holy Trinity Cathedral, at 279 South 300 West. Once at the heart of the city’s Greek Town, the parcels around the historic cathedral total about five acres of land, including several parking lots and the site of the distinct white La France Apartments, a set of about 60 aging row houses east of the church. (Leah Hogsten | The Salt Lake Tribune) Worshippers in the Greek Orthodox Church of Greater Salt Lake on Sunday endorsed talks with Salt Lake City-based Woodbury Corp. on a partnership to develop choice downtown properties around Holy Trinity Cathedral, at 279 South 300 West. Once at the heart of the city’s Greek Town, the parcels around the historic cathedral total about five acres of land, including several parking lots and the site of the distinct white La France Apartments, a set of about 60 aging row houses east of the church. (Leah Hogsten | The Salt Lake Tribune) Worshippers in the Greek Orthodox Church of Greater Salt Lake on Sunday endorsed talks with Salt Lake City-based Woodbury Corp. on a partnership to develop choice downtown properties around Holy Trinity Cathedral, at 279 South 300 West. Once at the heart of the city’s Greek Town, the parcels around the historic cathedral total about five acres of land, including several parking lots and the site of the distinct white La France Apartments, a set of about 60 aging row houses east of the church. (Leah Hogsten | The Salt Lake Tribune) Worshippers in the Greek Orthodox Church of Greater Salt Lake on Sunday endorsed talks with Salt Lake City-based Woodbury Corp. on a partnership to develop choice downtown properties around Holy Trinity Cathedral, at 279 South 300 West. Once at the heart of the city’s Greek Town, the parcels around the historic cathedral total about five acres of land, including several parking lots and the site of the distinct white La France Apartments, a set of about 60 aging row houses east of the church. (Leah Hogsten | The Salt Lake Tribune) Worshippers in the Greek Orthodox Church of Greater Salt Lake on Sunday endorsed talks with Salt Lake City-based Woodbury Corp. on a partnership to develop choice downtown properties around Holy Trinity Cathedral, at 279 South 300 West. Once at the heart of the city’s Greek Town, the parcels around the historic cathedral total about five acres of land, including several parking lots and the site of the distinct white La France Apartments, a set of about 60 aging row houses east of the church. (Leah Hogsten | The Salt Lake Tribune) Worshippers in the Greek Orthodox Church of Greater Salt Lake on Sunday endorsed talks with Salt Lake City-based Woodbury Corp. on a partnership to develop choice downtown properties around Holy Trinity Cathedral, at 279 South 300 West. Once at the heart of the city’s Greek Town, the parcels around the historic cathedral total about five acres of land, including several parking lots and the site of the distinct white La France Apartments, a set of about 60 aging row houses east of the church. (Leah Hogsten | The Salt Lake Tribune) Worshippers in the Greek Orthodox Church of Greater Salt Lake on Sunday endorsed talks with Salt Lake City-based Woodbury Corp. on a partnership to develop choice downtown properties around Holy Trinity Cathedral, at 279 South 300 West. Once at the heart of the city’s Greek Town, the parcels around the historic cathedral total about five acres of land, including several parking lots and the site of the distinct white La France Apartments, a set of about 60 aging row houses east of the church. (Leah Hogsten | The Salt Lake Tribune) Worshippers in the Greek Orthodox Church of Greater Salt Lake on Sunday endorsed talks with Salt Lake City-based Woodbury Corp. on a partnership to develop choice downtown properties around Holy Trinity Cathedral, at 279 South 300 West. Once at the heart of the city’s Greek Town, the parcels around the historic cathedral total about five acres of land, including several parking lots and the site of the distinct white La France Apartments, a set of about 60 aging row houses east of the church. (Leah Hogsten | The Salt Lake Tribune) Worshippers in the Greek Orthodox Church of Greater Salt Lake on Sunday endorsed talks with Salt Lake City-based Woodbury Corp. on a partnership to develop choice downtown properties around Holy Trinity Cathedral, at 279 South 300 West. Once at the heart of the city’s Greek Town, the parcels around the historic cathedral total about five acres of land, including several parking lots and the site of the distinct white La France Apartments, a set of about 60 aging row houses east of the church. (Leah Hogsten | The Salt Lake Tribune) Worshippers in the Greek Orthodox Church of Greater Salt Lake on Sunday endorsed talks with Salt Lake City-based Woodbury Corp. on a partnership to develop choice downtown properties around Holy Trinity Cathedral, at 279 South 300 West. Once at the heart of the city’s Greek Town, the parcels around the historic cathedral total about five acres of land, including several parking lots and the site of the distinct white La France Apartments, a set of about 60 aging row houses east of the church. (Leah Hogsten | The Salt Lake Tribune) Worshippers in the Greek Orthodox Church of Greater Salt Lake on Sunday endorsed talks with Salt Lake City-based Woodbury Corp. on a partnership to develop choice downtown properties around Holy Trinity Cathedral, at 279 South 300 West. Once at the heart of the city’s Greek Town, the parcels around the historic cathedral total about five acres of land, including several parking lots and the site of the distinct white La France Apartments, a set of about 60 aging row houses east of the church. (Leah Hogsten | The Salt Lake Tribune) Worshippers in the Greek Orthodox Church of Greater Salt Lake on Sunday endorsed talks with Salt Lake City-based Woodbury Corp. on a partnership to develop choice downtown properties around Holy Trinity Cathedral, at 279 South 300 West. Once at the heart of the city’s Greek Town, the parcels around the historic cathedral total about five acres of land, including several parking lots and the site of the distinct white La France Apartments, a set of about 60 aging row houses east of the church. (Leah Hogsten | The Salt Lake Tribune) Worshippers in the Greek Orthodox Church of Greater Salt Lake on Sunday endorsed talks with Salt Lake City-based Woodbury Corp. on a partnership to develop choice downtown properties around Holy Trinity Cathedral, at 279 South 300 West. Once at the heart of the city’s Greek Town, the parcels around the historic cathedral total about five acres of land, including several parking lots and the site of the distinct white La France Apartments, a set of about 60 aging row houses east of the church. 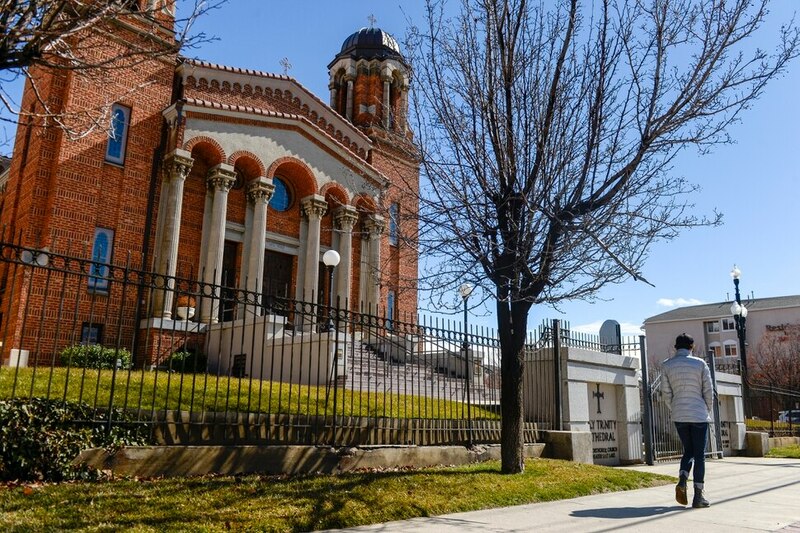 Utah’s Greek Orthodox community has taken a key step toward developing a choice cluster of downtown Salt Lake City properties surrounding the Holy Trinity Cathedral for the benefit of its future generations. In a special assembly Sunday, parishioners from Holy Trinity and Prophet Elias Church, who together make up the Greek Orthodox Church of Greater Salt Lake, gave the go-ahead for talks on partnering with Woodbury Corp. to develop as many as 5 acres around the cathedral at 279 S. 300 West. On the now-paved lots once at the heart of the city’s Greek Town, where the early roots of countless Greek families in Utah first took hold, Woodbury sees the possibility of building a hotel, offices, apartments, retail outlets and a large park, according to church documents. The Rev. Archimandrite George Nikas, presiding priest at Holy Trinity Cathedral, confirmed Monday the congregation had endorsed exclusive talks with the Salt Lake City-based developer, selected by the church’s real estate committee and other leaders from a list of six firms that submitted proposals in July. Nikas said existing facilities at the church needed renovation, and worshippers had authorized negotiations with Woodbury “simply to see what we can do with the properties.” A future development, the priest said, was also being explored as part of strengthening the community’s legacy for future church members. Church documents indicate that the church’s Parish Council and real estate committee heard pitches last fall from Woodbury and competing developers Hines, Cowboy Properties and Hamilton Partners, all prominent in Salt Lake City’s downtown residential and commercial markets. “Not only is the Woodbury proposal the best of the proposals, it is potentially a remarkable opportunity to build an exciting and stable financial future for future generations,” church leaders wrote in a March 5 letter to hundreds of parishioners, urging them to attend Sunday’s assembly. And if talks with Woodbury succeed, church leaders plan to convene a second special assembly to review its final proposal and have parishioners vote to approve or reject any deal. (Leah Hogsten | The Salt Lake Tribune) Worshippers in the Greek Orthodox Church of Greater Salt Lake on Sunday endorsed talks with Salt Lake City-based Woodbury Corp. on a partnership to develop choice downtown properties around Holy Trinity Cathedral, at 279 South 300 West. Once at the heart of the city’s Greek Town, the parcels around the historic cathedral total about five acres of land, including several parking lots and the site of the distinct white La France Apartments, a set of about 60 aging row houses east of the church. (Leah Hogsten | The Salt Lake Tribune) Dean Dinas kisses the Teotokos and Christ icon prior to leaving the Holy Trinity Cathedral Greek Orthodox Church during the 42nd Annual Greek Festival in Salt Lake City. (Leah Hogsten | The Salt Lake Tribune) The Olympian Dancers perform at the 42nd Annual Greek Festival on the grounds of the Holy Trinity Cathedral Greek Orthodox Church. The three day festival offers a wide variety of food and pastries, Greek musicians and dance performances. (Leah Hogsten | The Salt Lake Tribune) The Parthenon Dancers perform at the 42nd Annual Greek Festival on the grounds of the Holy Trinity Cathedral Greek Orthodox Church. The three day festival offers a wide variety of food and pastries, Greek musicians and dance performances. (Leah Hogsten | The Salt Lake Tribune) The Parthenon Dancers perform at the 42nd Annual Greek Festival on the grounds of the Holy Trinity Cathedral Greek Orthodox Church. The three day festival offers a wide variety of food and pastries, Greek musicians and dance performances. (Leah Hogsten | The Salt Lake Tribune) l-r Nektarios Mantas gets his picture taken as he braids the hair of Stavroula Limantzakis prior to their dance performance with the Athenian Dancers at the 42nd Annual Greek Festival on the grounds of the Holy Trinity Cathedral Greek Orthodox Church. The three day festival offers a wide variety of food and pastries, Greek musicians and dance performances. (Leah Hogsten | The Salt Lake Tribune) The Olympian Dancers perform at the 42nd Annual Greek Festival on the grounds of the Holy Trinity Cathedral Greek Orthodox Church. The three day festival offers a wide variety of food and pastries, Greek musicians and dance performances. (Leah Hogsten | The Salt Lake Tribune) The Olympian Dancers perform at the 42nd Annual Greek Festival on the grounds of the Holy Trinity Cathedral Greek Orthodox Church. The three day festival offers a wide variety of food and pastries, Greek musicians and dance performances. (Leah Hogsten | The Salt Lake Tribune) The Olympian Dancers perform at the 42nd Annual Greek Festival on the grounds of the Holy Trinity Cathedral Greek Orthodox Church. The three day festival offers a wide variety of food and pastries, Greek musicians and dance performances. 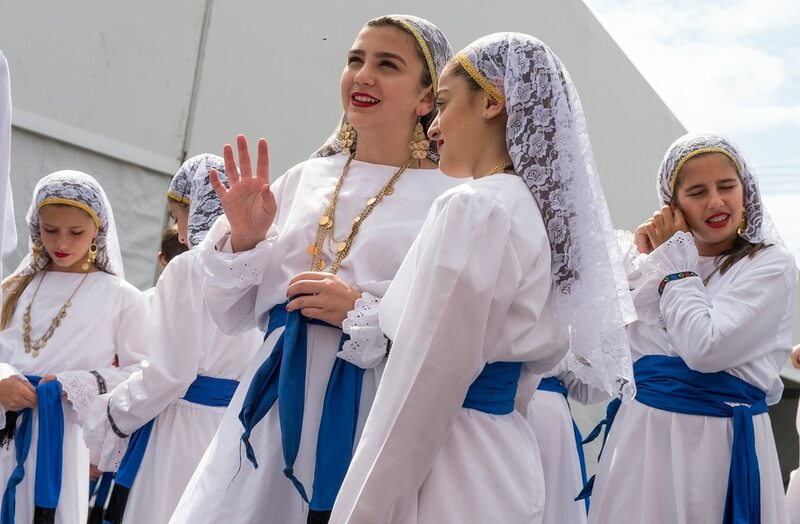 Until then, the parish priest Nikas said many key questions will remain undecided, including future contours of the church’s annual downtown Greek Festival in September, currently held on a parking lot north of the cathedral. Church documents indicate officials have entertained the possibility of closing down an adjacent street or park to host the event in the future. Utah’s first Greek Orthodox church was built about two blocks away in 1905, just as the region’s expanding mines and railroads began drawing new immigrants to Utah in large numbers. Today’s landmark Byzantine cathedral, listed on the National Register of Historic Places, was dedicated in 1923. The church owns a dozen or so parcels north and east of the Holy Trinity Cathedral, including the run-down row houses called La France Apartments to the east and several parking lots. It also owns a parcel across 300 West, south of the Crane Building, also used for parking. Combined, the properties are likely worth well above their roughly $10 million in total market value as assessed by Salt Lake County, especially given that contiguous land of that size is rare downtown, and the central business district is seeing a burst of new construction. The March 5 letter from church leaders said they were exploring what’s called an “unsubordinated ground lease." 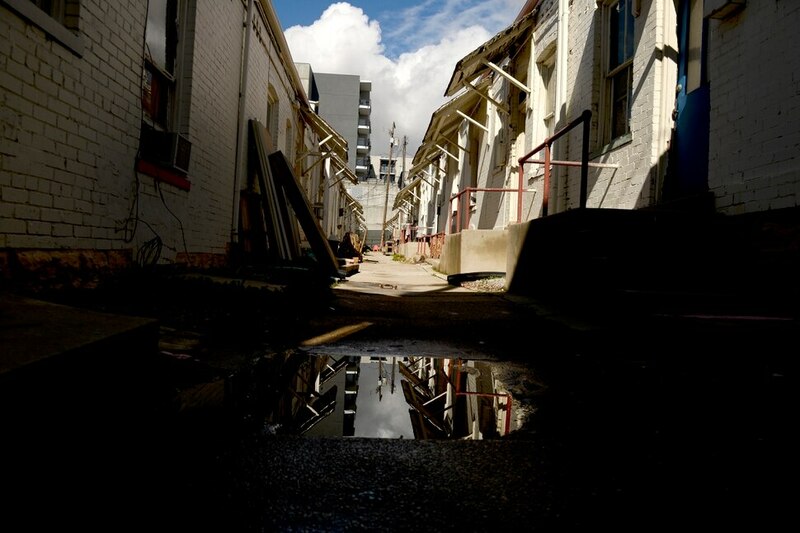 That approach would essentially let a developer borrow against the land on a long-term basis and invest in improvements, then hand the property and buildings back to the church when the lease expires. Under such a scenario, the letter said, a lender could not take the property back even if the developer went into default. Of the four developers asked to make presentations to church leadership, all suggested using the high-profile corner across from Pioneer Park to build new office space, a multistory apartment complex and upgraded parking structures. But a document sent with the parish’s March 5 letter indicated that only Woodbury had a master plan in mind that fully used all the parcels, including the Crane lot across the street, and took parking underground. Hines, Cowboy Properties and Hamilton Partners also all favored leaving the La France Apartments, with its 60-or so row houses and walk-up apartments and handful of storage units. 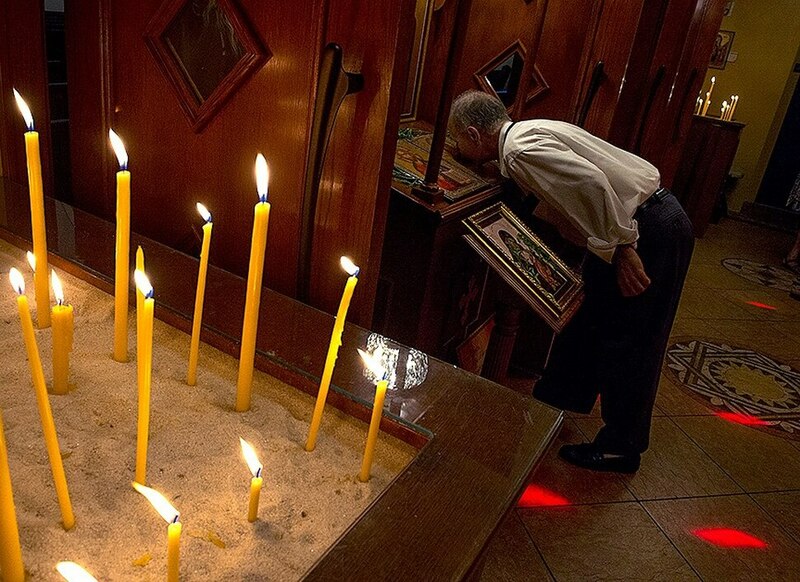 (Leah Hogsten | The Salt Lake Tribune) Worshippers in the Greek Orthodox Church of Greater Salt Lake on Sunday endorsed talks with Salt Lake City-based Woodbury Corp. on a partnership to develop choice downtown properties around Holy Trinity Cathedral, at 279 South 300 West, including the distinct white La France Apartments, a set of about 60 aging row houses east of the church. 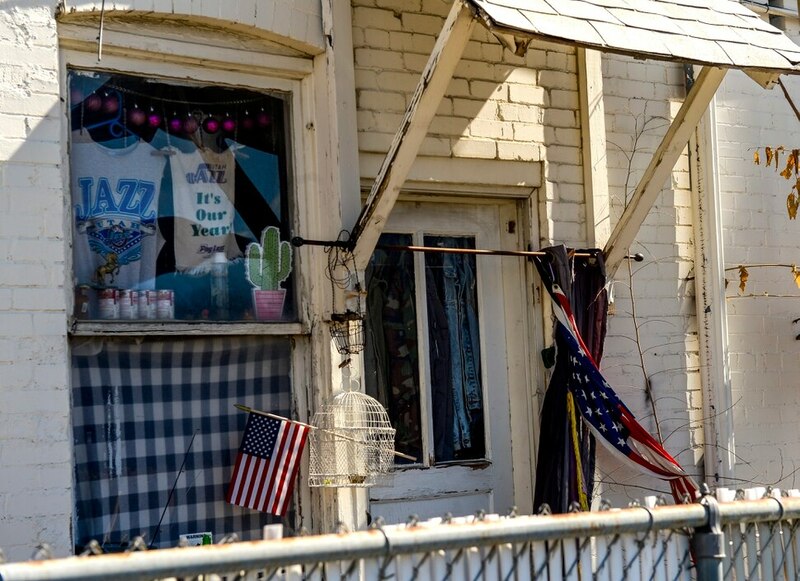 County records show the rentals — a relic of a type of close-knit housing for working families once common downtown — were built in 1905 and haven’t seen major renovation since 1969. 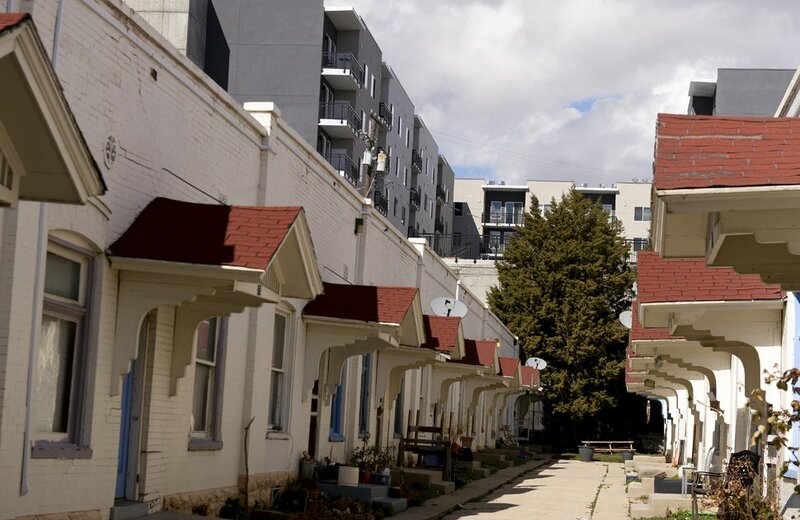 By Salt Lake City law, modest-income dwellings taken out of the housing stock would have to be replaced. An official with the city’s Department of Housing and Neighborhood Development said property owners are typically given up to two years to build replacements and wide latitude on where the homes are located.